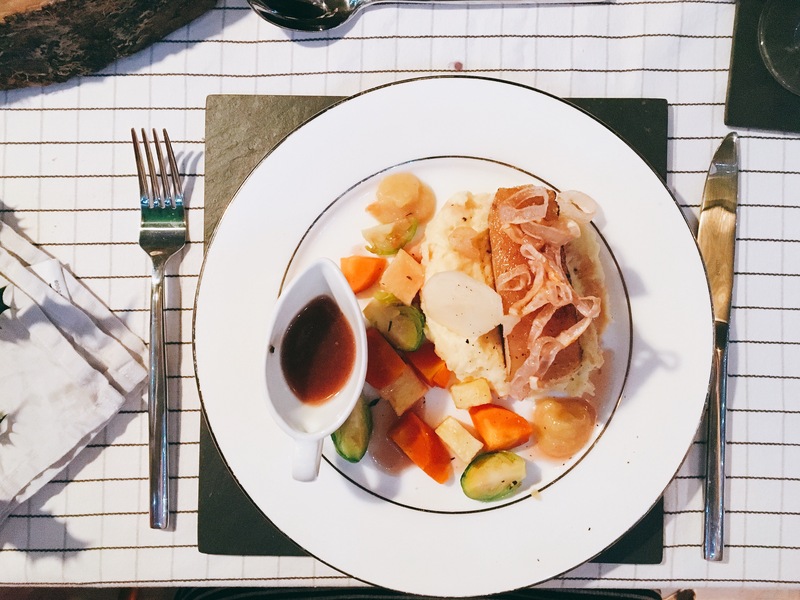 When I received an email from a company called La Belle Assiette offering to cook a private dinner for me* and up to seven guests in the comfort of my own home, I wondered what the catch was; surely this was too good to be true? A professional chef comes to your house, brings the dinner, cooks it, serves it and then cleans up afterwards? Sign me up! Side note: I’m officially a grown up now. After some research, I found that La Belle Assiette are actually an international company with a mission to change the food industry by putting people back at the centre of dining experiences. They offer a variety of services including private chefs, catering for large and small events and their aim is to take away all the stress from the host – they handle everything for you. As we are currently lodging in Granny May’s house we arranged for the dinner to be hosted at the house of my friend Sarah (of Brass Buttons and Confidence) for four of us (thanks love 😘). They were very accommodating – travelling to the Scottish Borders was not an issue. The run up to the meal was easy, well coordinated with me and the guests all receiving emails with reminders of the dinner. The chef herself emailed me the week prior to the meal to check in and ask if there were any dietary requirements. On the night, the chef, a lovely lady called Mari Brown turned up at 7pm on the dot and quickly familiarised herself with the kitchen and where everything was. She also brought along a very nice waitress for the evening. They offered to set the table for us but Sarah had already taken care of it. My gal sure knows how to lay a table 👌🏼 how pretty is this autumn into winter set up? It did feel slightly odd having a stranger in the kitchen (and it wasn’t even my kitchen!) slaving away over a hot stove while we were sitting drinking in the front room. After, very Britishly, offering her help on several occasions and being politely declined we began to relax (the wine obviously helped too). Shortly before dinner was due to be served, the company had arranged for a photographer to come and take photos of Mari’s dishes – he too was punctual, friendly and polite. 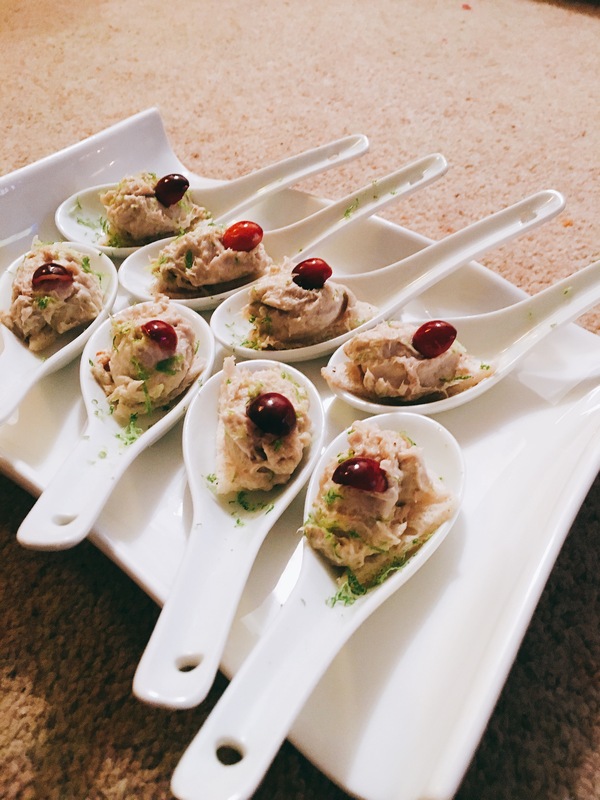 Seemingly a simple, classic canapé, we were all delighted and surprised at the addition of lime and ginger interlaced through the mackerel, giving it a very refreshing and different taste to any other mackerel paté I have ever had. The addition of a cranberry cut a sharp line through the creaminess of the mackerel paté; the acidity of the lime, ginger and cranberry contrasted the mackerel expertly. 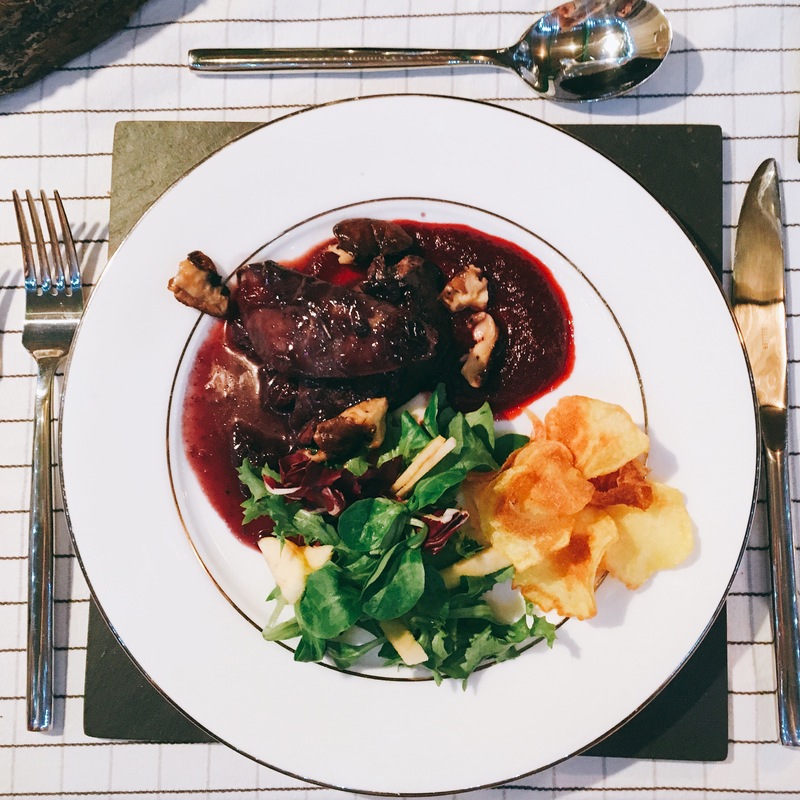 The pan fried pigeon breast was bursting with flavour and cooked nicely accompanied by a tart blueberry jus and earthy beetroot puree. It was served with a crisp apple side salad and homemade potato crisps. Both the blueberry and beetroot worked really well and the crisps gave the dish texture. The beautiful presentation matched the flavours in this dish. A generous portion of pork loin on a bed of creamy parnsip mash, I couldn’t detect any smokiness but it certainly wasn’t lacking anything, the vegetables were all perfectly cooked and the crispy shallots were indeed crispy. The accompanying gravy was flavoursome and there was a quince sauce on the side – a revelation – which is sharper and tarter than apple and worked perfectly with the pork. Our only criticism was that the pork was slightly overdone but we all agreed it must be difficult to get used to different ovens every night. That aside, the dish was delicious. 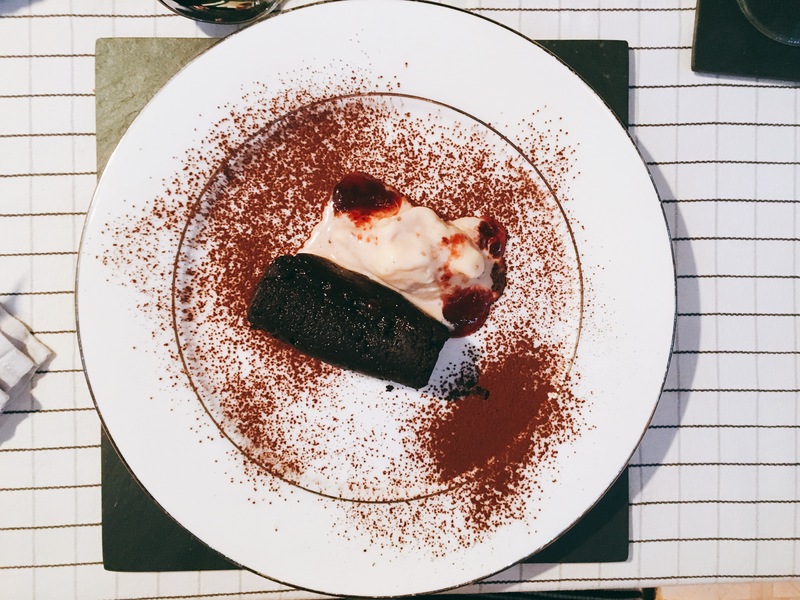 Everyone else loved this rich, indulgent chocolate cake which had a slightly gooey centre. Personally, I don’t like chocolate cake so I happily just ate the damson ice cream. Like with the lime and ginger in the mackerel and the quince sauce on the main course, damson ice cream was a revelation. Damsons are a relation of the plum and the creaminess of homemade ice cream was really very lovely, laced with damson jam. 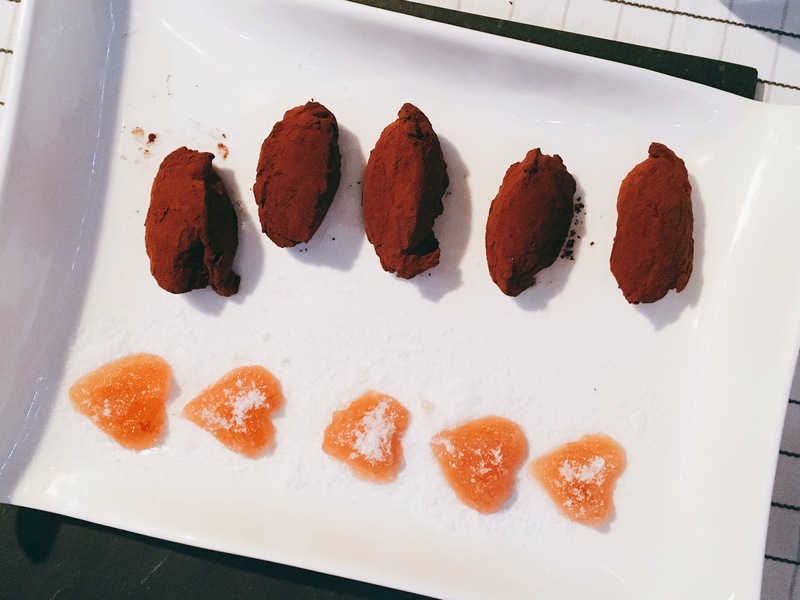 After the rich chocolate cake, the others were slightly dubious about having more chocolate but were surprised and happy to find that they were in fact quite light truffles. The jelly had a strong flavour of whisky (like marmite, you either love it or you hate it) but without the alcohol afterburn. The sweets rounded off our evening perfectly. Shortly thereafter, Mari came through to say that she was finished and that all the leftovers had been packaged up for us to eat later. The kitchen was spotless. From start to finish, the evening went smoothly and you could really relax in the knowledge that Mari was the expert and happy to be there. She and the waitress (whose name I have forgotten, sorry) could not have done more; they even offered to clean up our glasses for us which we had to politely decline after having not lifted a finger all evening! Prices for their Private Chef services start from £39 per person. Now, if you went out to a decent restaurant and each had three courses that could easily come to just shy of that, plus add on taxis to and from the restaurant; if you have children you have to factor in a babysitter; drinks at a restaurant would be, at least, three times as expensive as they are when you buy them yourselves. When you add all of that up it actually works out cheaper to have the chef come to you! If you would like to find out more about La Belle Assiette and their services, head over to their website where it has all of the chefs on offer along with their menus. I also like their ‘11 (very serious) reasons to book a La Belle Assiette private chef‘ if I still haven’t quite convinced you what a great idea this whole concept is. 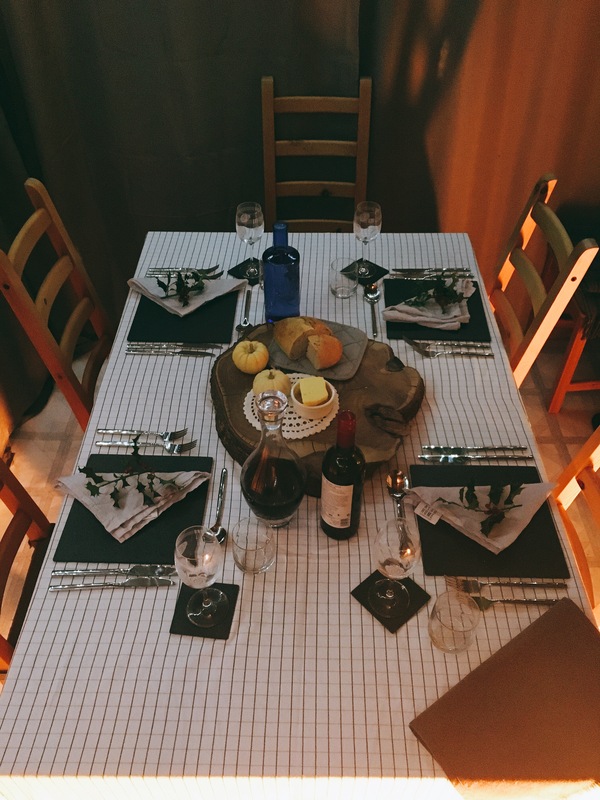 *The meal was provided to me and my guests free of charge for the purpose of this review but all words, photographs, opinions and thoughts are – as always – completely my own (and my guests’). Wow, that looks great! One day, when I don’t have a tiny little kitchen, I will have to do this! It was so good! Sounds expensive at first but quite reasonable for the service!